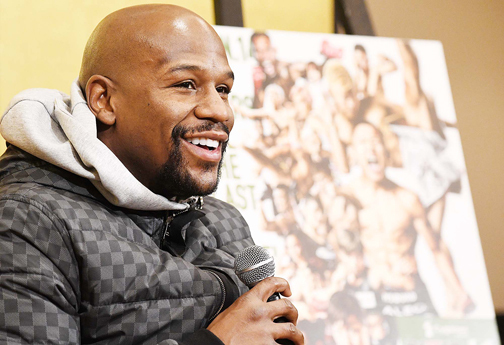 Tokyo—US boxing legend Floyd “Money” Mayweather said Saturday his focus was on entertaining the fans during his New Year’s Eve fight with Japanese kickboxing prodigy Tenshin Nasukawa near Tokyo. The 41-year-old unbeaten champion has been tempted out of retirement -- again -- for a one-off “exhibition” in Saitama, north of Tokyo, against “Ninja Boy” Nasukawa, a fighter more than half his age at 20. “Me getting knocked out or me getting knocked down ... I don’t worry about it at all. If that does happen, I mean that’s entertainment. That’s all we need to see,” said Mayweather. “All I have to do is to give 100 percent ... Since Mayweather is expected to dodge my offense, I really want to hit him,” said the 20-year-old.